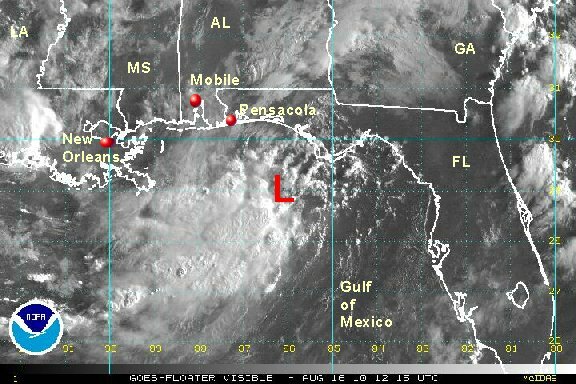 A large upper low is over the southeastern Gulf of Mexico. Usually this is not of concern for tropical development. When the low sits over warm tropical waters for several days, it has a chance to transform into a tropical system. This looks to be the case this time as a weak low is now shaping up north of Key West. Interests in the northcentral Gulf should follow the progress of the tropical disturbance. The low is predicted to be near land in the next couple of days. Some models develop the low before landfall. 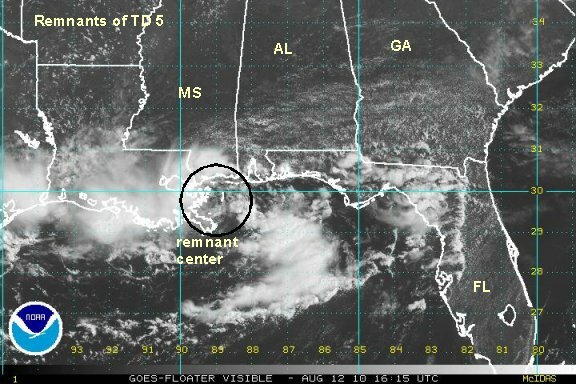 A reconnaissance hurricane hunter has been investigating the southeastern Gulf today. It seems that a low pressure center has developed. Radar observations also show a spin now off the coast of southwestern Florida. We believe that this will be named the next tropical depression soon. Radar, satellite and reconnaissance hurricane hunters have confirmed that a low has formed off of the southwest Florida coast. 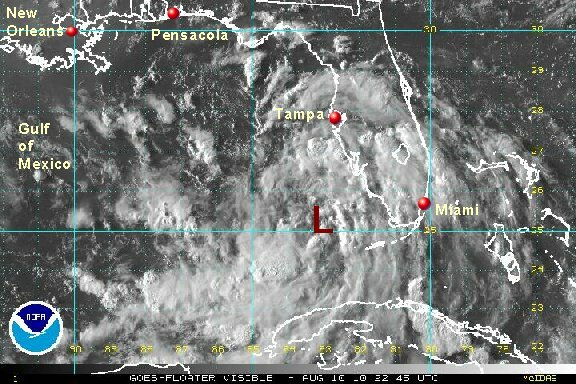 It is a little surprising that NHC did not classify at the 5 pm advisory. A buoy in the southeast Gulf has had a wind gust to 30 knots - not too far from tropical storm strength. At 8 pm edt the tropical disturbance was centered at 25.8 N / 83.2 W or about 155 miles south southwest of Tampa, Florida or 425 miles southeast of the mouth of the Mississippi. Top sustained winds are estimated at 30 mph. Pressure is 1008 mb. Interests in the northcentral Gulf should follow the progress of the tropical disturbance. The low is predicted to be near land by around Thursday morning. The forecasts take this system generally toward the southeastern Louisiana coast. Keep in mind that this is a "first guess" by the models. Some have it making landfall late Wednesday night, others as late as Thursday around noon. Models are differing greatly on strength at the present time. Once inland, the low weakens and recurves through Louisiana, Mississippi, then into northern Alabama / Tennessee. It will bring a heavy rain threat and possibility of isolated tornadoes. NHC officially classifies tropical depression 5. The convection from tropical depression 5 became very weak last night. One ball of thunderstorms remain. The low level center is also very hard to discern - yet another case where the Quickscat satellite would have been a great help! NHC says that the center was hard to locate also on their last advisory was well as doubting their 35 mph strength. We fully concur. The I.R. satellite shows what looks to be the surface center well west of the official NHC location. It is in an area of no convection. another spin is noted near the ball of thunderstorms a little farther southeast of the official location. Once we get a few visible satellite images in a few hours we'll know much more where that center actually is. Overall this is good news since tropical depression 5 will be inland in about 24 hours, giving it less time to develop. Right now, NHC's classification of td 5 being a minimal tropical storm at landfall seems reasonable. At 7 am edt / 6 am cdt tropical depression 5 was centered at 26.8 N / 85.1 W or about 290 miles southeast of the mouth of the Mississippi. Top sustained winds are estimated at 30 mph (NHC 35 mph). Movement is nw at 10 mph. Pressure is 1008 mb. Interests in the northcentral Gulf should follow the progress of the tropical disturbance. The low is predicted to be near the southeastern Louisiana coast by Thursday morning. Visible satellite imagery confirmed what we suspected earlier - that the low pressure center was not near the official estimate. In fact we are estimating it a little farther west in the middle of a cloud swirl. We agree with NHC that this is more like a cloud swirl than a low pressure center. This all means that td 5 is still struggling with the heaviest showers and storms removed far from the center of circulation. It is difficult for a tropical cyclone to strengthen significantly with such a broad center. We think that there is a good chance that tropical depression 5 will not make tropical storm strength before landfall. This "landfall position" will be nearly meaningless since the low is only a swirl of clouds. The greatest impact will be with thunderstorm squalls currently well away from the center. Right now the heaviest showers and storms are a 100-200 miles southeast of the center. Buoy data only supports winds gusting to over 25 mph. There may be stronger gusts over 30 mph under the scattered thunderstorm clusters. Seas generally are 3-5 feet in the eastern Gulf. At 11 am edt / 10 am cdt tropical depression 5 was centered at 27.8 N / 87.3 W or about 130 miles southeast of the mouth of the Mississippi. Top sustained winds are estimated at 20 mph (NHC 30 mph). Movement is nw at about 10 mph. Pressure is 1008 mb. Interests in the northcentral Gulf should follow the progress of tropical depression 5. The low is predicted to be near the southeastern Louisiana coast by Thursday morning. Once inland, the low weakens and recurves through Louisiana, Mississippi, then into northern Alabama. The low may weaken and 'wash out" over Alabama. It will bring a heavy rain threat and possibility of isolated tornadoes. The hurricane center agreed with our previous assessment. The low was very diffuse. 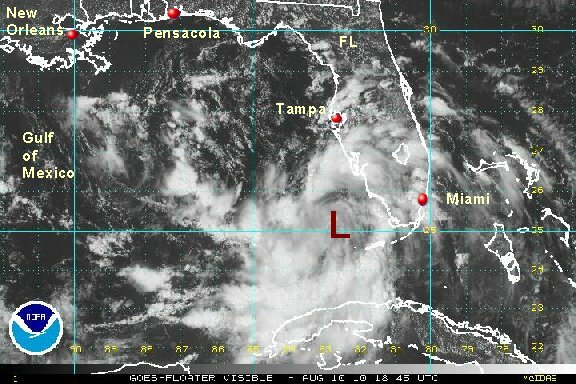 Tropical depression 5 offically dissipated at 5 pm edt. This will be the last update on td 5. Locally heavy rain is still possible along the Gulf coastal states over the next few days. The circulation from tropical depression 5 is looking better today than anytime in its life span except while it was southwest of Florida. The low level circulation is apparent on visible satellite, buoy reports, and radar imagery. The low is centered east of Louisiana in the Breton Sound. Top sustained winds are only 15-20 mph. Heavy rain is falling offshore of the western Florida panhandle and near New Orleans. Forecasts drift this low into southern Mississippi / Alabama Friday and Saturday continuing the chances of locally heavy rain. Tropical depression 5 making a comeback? 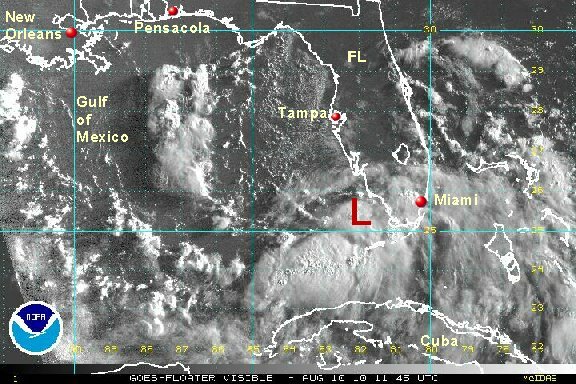 The circulation with tropical depression 5 is now in southwest Georgia moving into the panhandle of Florida. It will be in the Gulf Monday. 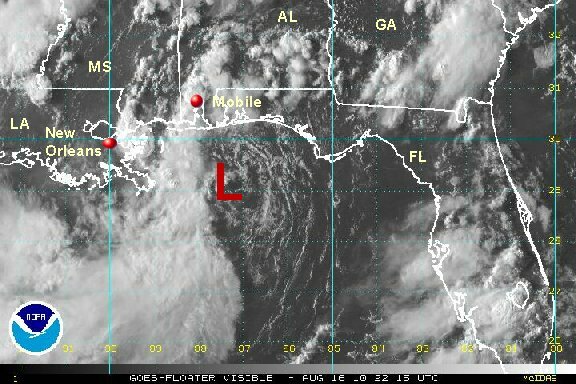 Forecast models develop the low some as it moves west near or just offshore of the Louisiana coast. Interests from the Florida panhandle, southern Alabama, southern Mississippi, Louisiana, and the upper Texas coast should follow the latest on the remnants of tropica depression 5. After spending a few days inland across Alabama and Georgia, the remnants of tropical depression 5 are coming back to life. 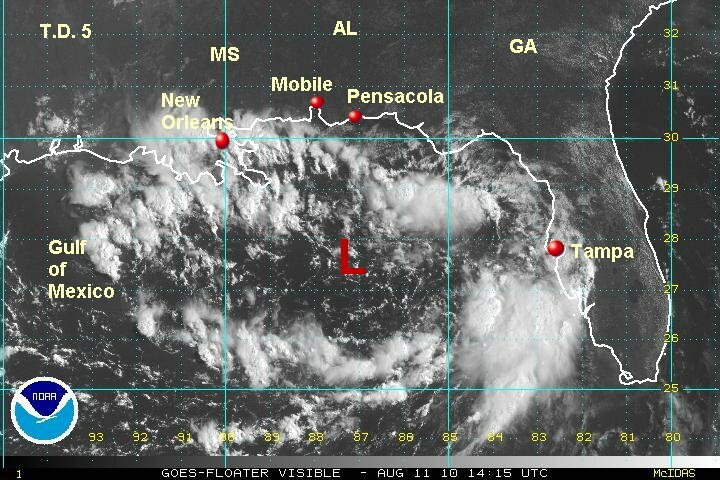 The low pressure area moved south yesterday and now is a little over 100 miles south of the Florida panhandle. Deep convection is building and conditions look favorable for some strengthening before landfall within 24 hours. As of 9 am edt. 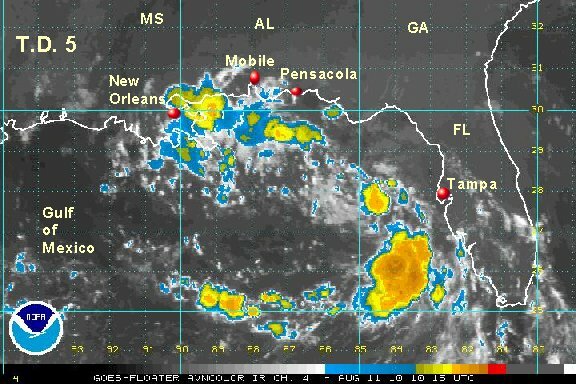 regenerating tropical depression 5 was centered near 29.0 N / 86.3 W or about 115 miles south southeast of Destin Florida / 165 miles east of the mouth of the Mississippi. Motion is to the west at about 5 mph. Top sustained winds are estimated at 20 mph. Pressure is estimated at 1010 mb. Forecasts take this low pressure system toward the southern coast of Mississippi / southeastern Louisiana over the next 24 hours. With less than 24 hours over water, remnants of td 5 will only be able to strengthen some.... perhaps into a minimal tropical storm. 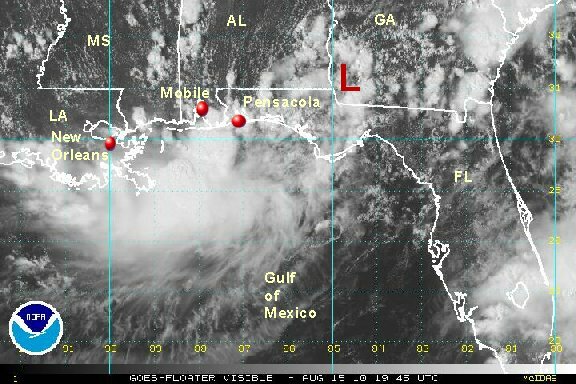 Interests from the Florida panhandle, southern Alabama, southern Mississippi, Louisiana, and the upper Texas coast should follow the latest on the remnants of tropical depression 5. It appeared that tropical depression 5 had made a comeback for several hours. By this evening, northeasterly wind shear from aloft had exposed the low level circulation. With this happening, it is not likely that the remnants of tropical depression will strengthen much before moving inland near the coast of Mississippi / Louisiana by Tuesday morning. As of 7 pm edt. regenerating tropical depression 5 was centered near 29.0 N / 87.3 W or about 100 miles east of Breton Sound / 125 miles southeast of the Mississippi coast. Motion is to the west at about 5 mph. Top sustained winds are estimated at 20 mph. Pressure is estimated at 1010 mb. Forecasts take this low pressure system toward the southern coast of Mississippi / southeastern Louisiana over the next 12 hours. With the effects of wind shear, this low will likely stay weak.. Heavy rain will be the main concern. The low pressure center has just moved inland on the Mississippi / Louisiana coastal border this morning. Scattered heavy showers can still be expected on the northcentral Gulf coast and inland. This will be the last update on this system.